Ultimate Frisbee is now known in many countries simply as the less-catchy “Ultimate” due to the fact that Frisbee is a registered trademark. It is a fast-paced sport with similarities to netball, football (soccer) and American Football. 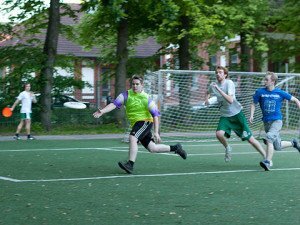 Played by around five million people in the US and with leagues in the UK and other European countries, Ultimate is a far cry from the humble origins of the Frisbee. As with many inventions there are multiple reported variations on how Frisbees came to be, but the commonly agreed version is that it comes from the Frisbie Baking Company, whose empty metal pie tins were thrown by college students in the 1920s. Subsequently, in 1948, Walter Morrison invented a plastic version with improved aero-dynamics, and then followed the Pluto Platter. Ultimate was created in 1967 by students at Columbia High School and in 1979 the Ultimate Players Association, now USA Ultimate, was formed. The sport has grown from its early years as a relaxed sport played for fun and increasingly attracts better athletes and is played more competitively. The object of Ultimate is to pass the flying disc to a player in the endzone of the pitch and in so doing a goal is scored. As in rugby and American Football the ends – the last 18m in this case – of the pitch are the scoring zones. The winner is usually decided by whichever team is first to score a specified number of goals or whichever team scores the most goals in a given timeframe. One of the beauties of the sport is that very little equipment is needed, with an inexpensive disc and an open space sufficient for a rudimentary game. Ultimate is contested between two sides of seven players with substitutions permitted and so with a disc, seven bibs and a field you’re away! The pitch is 100m long with the endzones, as said, 18m deep at either end. It is 37m across and a regulation disc is 10.75 inches in diameter and weighs 175g. Points are scored by getting the disc to one of your players in the end zone by passing it through the air. That’s the only way to score, making the game a very simple one to understand and play. Games are usually played as the first side to reach 15 or sometimes 17 goals, although any number can be agreed between the teams. Sometimes games are played over two 15 minute periods with a five minute half-time break. In these games the side with the most goals at the end is deemed the winner. The match is started by a “pull”, where one side throws-off to the other. A player cannot run with the disc and must stop as soon as they receive it, although they may pivot on one leg (a la netball). If a pass hits the floor, is intercepted or is caught out of bounds possession goes to the other side. A player in possession has 10 seconds in which to pass the disc or they cede possession to the opposition. The defender (marker) makes the count (stall count). Ultimate is a non-contact sport and defenders may only stand within three meters of the disc-holder. Substitutions are only allowed after a goal has been scored (and before the throw-off), to replace an injured player or after periods of play and not during a timeout. Ultimate is self-officiating and, indicative of its origins and free-spirited reputation, the Spirit of the Game (SOTG) is highly respected. Only a fouled player may call or appeal for a foul and there is a strong spirit of respect and sportsmanship demanded. Many other sports could do well to take heed.